People love buying things, especially people who can afford it. Someone, who has chosen to remain anonymous, has bought the historical RB3 at the online auction that was held by the Red Bull team on Sunday night. The new owner paid €210,050 and he was proud of it. With this purchase he took part in aid of the Wings for Life charity, a foundation set up to fund research into spinal injuries. Plus he became the owner of the legendary car which was driven by the Red Bull team member David Coulthard at the 2007 British Grand Prix. 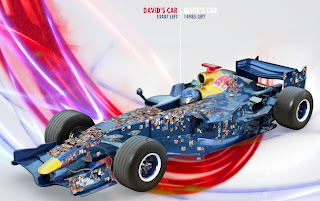 The cars bodywork was covered by a huge collage, thousands of photographs of Formula One fans.